The School Board quartet formed in 2012 in order to perform in Tallwood High School's production of "The Music Man." Members of the quartet (L-R) are Ross Wilkins (Tenor), W.D. 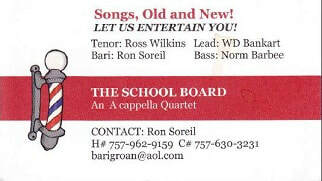 Bankart (Lead), Norm Barbee (Bass), and Ron Soreil (Baritone). All four are longstanding members of the Norfolk Chapter of the Barbershop Harmony Society.